My boots have edged their way out of the closet, pumpkin spice beverages have returned to Starbucks, and I can almost smell the autumn chill in the air. I know they seem a little impractical (and maybe a tad sweaty), but I really want a pair of real leather skinny pants. Not leather look leggings, not coated or waxed cotton twill jeans. I want real leather that will last forever in a classic skinny jean style. Unfortunately, real leather pants (skinny or otherwise) tend to be way, way upwards of $200, and I don't even really want to spend that much. ...Then again, what with sales tax and all the total will be about $200. What do you guys think? 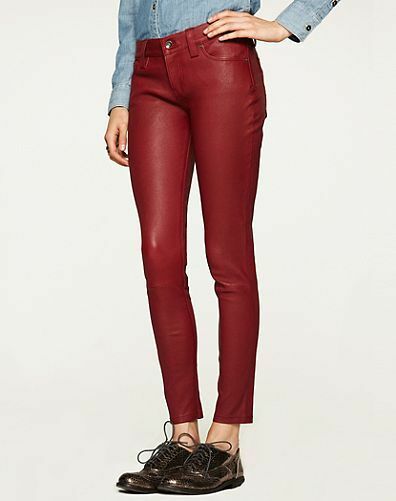 Do you like leather skinny pants, or do you think I've just succumbed to a bad bout of fall fashion fever?